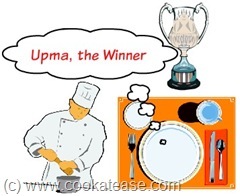 Upma the common south Indian dish has become very popular now in the United States of America. A three course meal prepared by Floyd Cardoz (Indian-born chef) has won USD 100,000 prize in Bravo TV Show of U.S on June 15, 2011. Floyd Cardoz prepared Wild Mushroom Upma Polenta with Kokum & Coconut Milk as 1st Course. The three course meal was prepared by recollecting his memory in his life and career.